HOUSTON - Jose Altuve may have slightly overestimated just how good rookie Carlos Correa is after his RBI single in the 13th inning gave the Houston Astros a 3-2 victory over the Tampa Bay Rays on Wednesday night. "What can I say? He's the best player in the world," Altuve said. 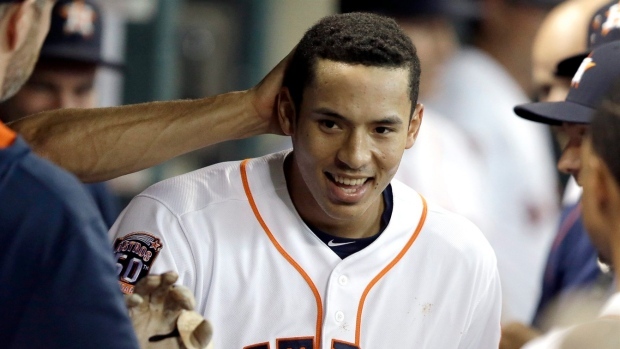 He's probably not there yet, but the top overall draft pick in 2012 is undoubtedly growing into one of Houston's best players as the AL-West-leading Astros make a push for their first playoff berth in 10 years. Correa also homered for the Astros, who got their second straight extra-inning win after Marwin Gonzalez's 10th-inning homer gave them a 3-2 victory Tuesday night. "It was really exciting," Correa said of his first walk-off hit. "One of the greatest moments so far to be able to get a hit to help your team win the ballgame is always fun. To be able to do it in back-to-back days, Marwin yesterday, me today was really special." Colby Rasmus walked with one out in the 13th and advanced to third on a single by Altuve off Matt Andriese (3-3), who was called up from Triple-A Durham on Wednesday. Correa's grounder to right field with two outs in the inning scored Rasmus to give Houston the victory. "The zone control that he shows, the discipline is exceptional," manager A.J. Hinch said. "So it was nice to have him up at bat." Josh Fields (4-1) got the last two outs of the 13th for the win. Neither team got a hit in the 10th and 11th innings. They both got one in the 12th, but were unable to do anything more. The Rays have lost five of their last six games. "They're tough losses," manager Kevin Cash said. "Losses are losses. Whether they come in the 10th, they come in the 13th or they come in the ninth. They all count the same. I don't think there's any sense of desperation at all." The Astros tied it 2-2 on a single by Evan Gattis off All-Star closer Brad Boxberger with one out in the ninth inning. Correa launched his two-out solo homer to the seats in left field to make it 1-0 in the first. The Rays had trouble stringing hits together against Dallas Keuchel until the seventh. Logan Forsythe singled to start the inning and scored on Tim Beckham's triple to centre field with one out to tie it at 1-all. Fans booed loudly when he scored, still upset about a play before his single when they thought a fan interfered with Luis Valbuena's chance to catch his foul ball. James Loney's one-out sacrifice fly to right field sent Beckham dashing home. The throw was offline but he didn't realize it and he leapt over a diving Hank Conger on the way to the plate to put the Rays on top. Rookie Nathan Karns allowed six hits and one run with eight strikeouts in six innings. It was the 18th start where he allowed two or fewer runs, which ties a franchise rookie record set by Rolando Arrojo in 1998. Keuchel yielded seven hits and two runs with five strikeouts in 7-plus innings. Lowrie singled after Correa's homer, but the Astros didn't get more than one hit in an inning until the ninth. Rays: LHP Jake McGee travelled to Tampa on Wednesday and was scheduled to see a doctor on Thursday morning after injuring his left knee on Tuesday night. "He felt it on the second to last pitch of the outing," Cash said. "We're hopeful that it's not something that's too bad." Astros: OF Carlos Gomez was out of the lineup on Wednesday dealing with a cough and other flu-like symptoms. Hinch hopes he'll be able to return on Thursday. Tampa Bay's Chris Archer (10-9, 2.92) opposes Collin McHugh (13-6, 4.09) when the series wraps up Thursday. Archer looks to bounce back from his last start where he allowed 11 hits and eight runs in 5 1-3 innings in a 12-4 loss to Texas.